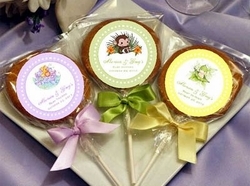 Celebrate your Baby Shower with our beautifully, handmade personalized Cookie Lollipops! Introducing our famous Baby Shower COOKIE POP favors. What a novel idea! So unique and trendy! Our delicious, Baby Shower Cookie Pop arrives completely assembled as shown - Choose from one of our delicious home made *cookies! Our cookie pops are double wrapped in clear cellophane, printed with the image of your choice and personalized with your choice text on the cookie pop label. (label is not edible) Your cookie favor is tied with matching curly ribbons FREE! TOO CUTE and ABSOLUTELY DELICIOUS! Eat the yummy cookie and save the personalized label as a special memory. Our Baby Shower Cookie Pops measure approximately 3 1/2 inches wide by about 8 1/2 inches high (including stick). Our Personalized Cookie Favors are made to order. Each cookie arrives freshly baked! * Choose from Sugar Cookie or Chocolate Chip.